Hello from sunny southern California. My name is Thomas and I work at the Japan Foundation, Los Angeles! I want to share with you a program we organize called the JET Memorial Invitation Program (JET-MIP), which was started last year after the 2011 Great East Japan Earthquake and Tsunami, to commemorate the lives of two Americans participating in the JET program named Taylor Anderson and Montgomery Dickson who sadly lost their lives during the disaster. 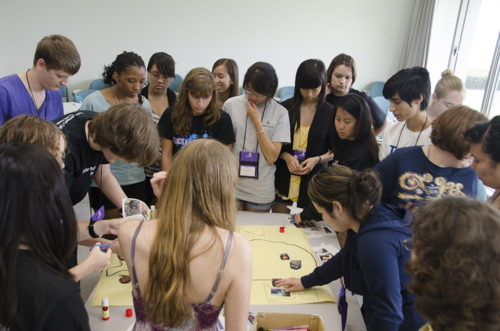 Participants for this program were selected from schools all across the United States and they have all been studying Japanese all throughout high school and most had never been to Japan. Their first stop was in Los Angeles where they participated in a pre-departure orientation at our office. Then it was off to Japan. 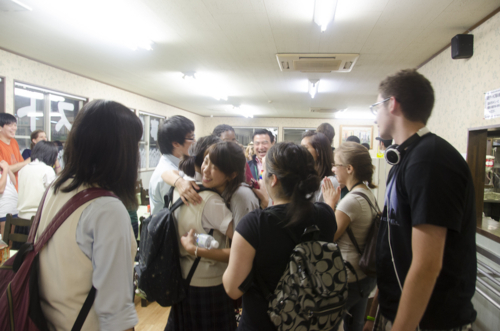 During their initial stay, the participants learned about the institute, the JET program, and even some Tohoku dialect. They also spent some time making a collage showing various landmarks in the United States and cities where they are from. This was later presented to the elementary schools they visited. Then it was off to the Tohoku region. While in the Tohoku region, they visited an elementary school and also participated in the first ever high school summit with students from two local high schools in Rikuzentakata. The topic of the summit was how they can work together for the future and after the discussions; the students presented their findings. This was a good opportunity for the participants to exchange ideas with their counterparts in Japan and make some new friends in the process. The last few days in Tohoku were spent orienteering in Sendai and then it was off to Ishinomaki where the participants visited the local elementary school where Taylor Anderson taught and also Taylor’s Bunko (Reading corner), which was created in her memory. Later that day they had an exchange with the Kiwi Club, an English conversation group where Taylor taught and made friends. This event wrapped up the Tohoku portion of the trip as the participants returned to Sendai that night and flew back to Osaka the following day. Upon their return, they paid a visit to a local High School where they met their host brother or sister. Together, they travelled to the Consulate General of the United States in Osaka to talk about themes relating to international diplomacy. After visiting the Consulate, the students parted ways and the next day was spent in the classroom going over the Tohoku trip, learning Osaka dialect, and preparing for the weekend homestay. 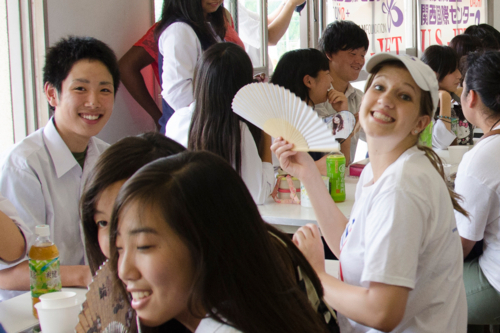 The big weekend finally arrived when the American students met their host families for a weekend of cultural experience in the Kansai region. 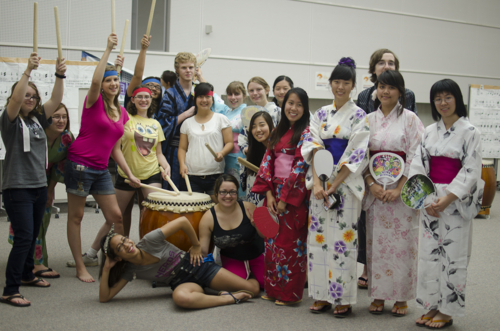 When they returned from their homestay, the cultural experience continued at the Institute with workshops covering Wadaikos and Yukatas. On the final day at the institute, preparations began for the trip home and also for the completion ceremony. After the introductory speeches, the participants had a final chance to talk with their host families and even performed a song and dance. The night ended with final goodbyes and the next day, the group departed Osaka for the wrap-up meeting in Los Angeles. At the wrap up meeting, the participants presented their experiences in Japan. Many talked about their eye opening experience, the friendly people they met during the trip and the new friends they made. 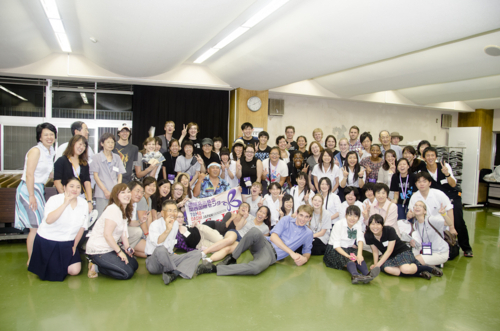 This experience motivated them more to continue studying Japanese and eventually participate in exchange programs such as the JET program just like Taylor Anderson and Montgomery Dickson. 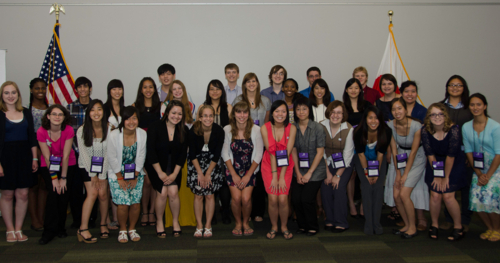 After the meeting, the participants had one more night together as the program slowly came to a close. The following day, each participant would leave just as they had arrived and return back to their hometowns all across the United States. I will be writing a more detailed overview of the trip in an eight part series in our monthly newsletter below. There you will also be able to read the essays written by the students, which will be distributed across the next eight issues. Hope you all enjoy their stories (English Only).